A bedroom is not just another room, where you can sleep, but also a place where a person or a couple can relax, think and find solutions to some daily problems. Obviously, a bed will play a crucial part in the decor picture. 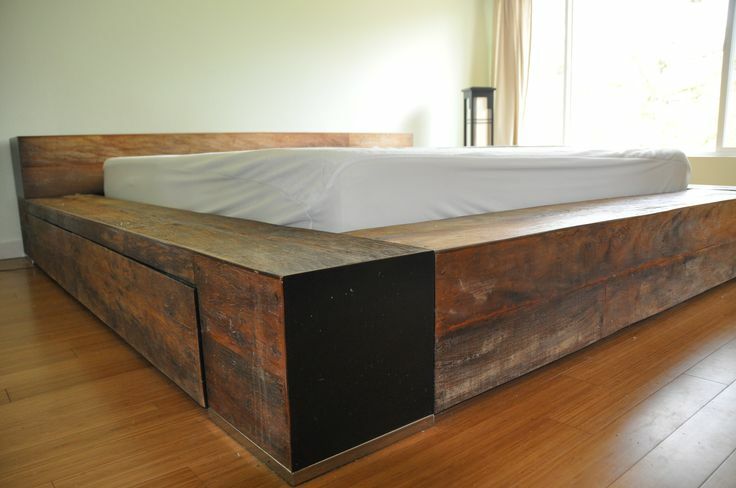 So, here are creative ideas on chunky wooden beds for sale — you might find some of them useful. The bed is usually the focal point of the room, so you should choose it very carefully. After all, if you pick a chest of drawers or wardrobe unsuccessfully, it will be uncomfortable to store things; an uncomfortable low-quality bed, on the other hand, will not only spoil the mood, but also cause severe back problems. Production material is one of the most important decisions you will have to make while looking for a new bed. Some time ago, MDF furniture was extremely popular, but now most people refuse to use it, and chunky wooden beds made of genuine material are at the peak of popularity. Furniture with metal, tempered glass, plastic, and even mirror inserts is another popular option that can stylishly accessorize the interior. In a bedroom (, however, solid wood is one of the best options you can go with. You can surely mix it with glass and metal if you want to give the environment a modern look. However, a bedroom decorated with wood only looks elegant and cosy. Chunky wooden beds are now available in a wide variety of shapes and sizes, and can even be custom-made. Ever since ancient times, this material has been the dominant one while building furniture — not only because the forests were rich, but also because wood always stood for quality and durability. Wood has always been an excellent material. Still, even though it is environmentally friendly, it requires special handling and maintenance. This time-tested material is well bent, and it can be painted, carved, ornamented, glued, etc. Wood prices depend on the class of timber, as well as its hardness. The most expensive and rare varieties include hard types, like yew, hornbeam, dogwood, boxwood, and acacia. More affordable and soft options are oak, birch, beech or walnut. Pine is one of the most delicate, and, consequently, most affordable wood types. However, it is still way sturdier than MDF. Keep away from the water! Any wooden furniture is afraid of the water. When cleaning , avoid using an excessively damp cloth; polished surfaces, in general, can only be cleaned with a soft, preferably flannel, cloth. If the furniture has been accidentally chipped or scratched, it is best to contact the experts, who carefully fix the flaw with a special primer and varnish. If you take care of the maintenance, solid wood furniture will delight you with its beauty, warmth and comfort for decades.